I can't believe it's Thanksgiving week already! I am sooo looking forward to cooking on Wednesday. Pecan pie, here I come! I've been in the holiday spirit over the weekend, making Christmas ornaments. 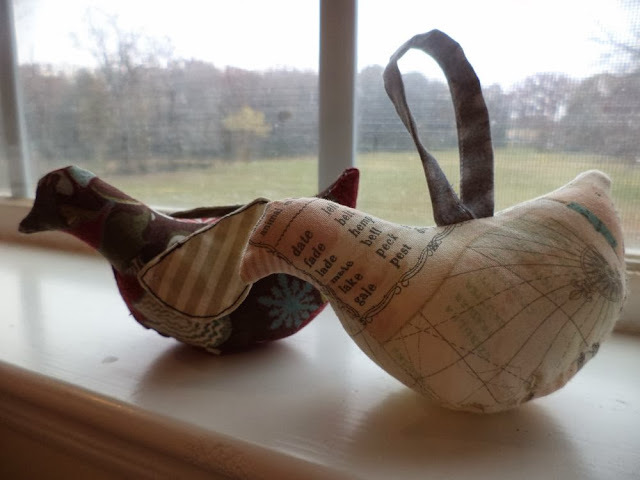 I've made 5 of these little stuffed birds. The tutorial is by Joel Dewberry, here. I decided I like the bird better without wings, and I also downsized it to 70%. In case you're curious, this is how I downsize patterns. Just adjust the "view" size of the pdf pattern to the size you want your finished product and use your laptop screen as a light box to trace the pattern lightly onto paper. Finally, I've made the last few blocks for the QAYG Simple Sampler. I have to stay several weeks ahead of the tutorials, which go up every Monday. (Today's Dutchman's Puzzle block here.) 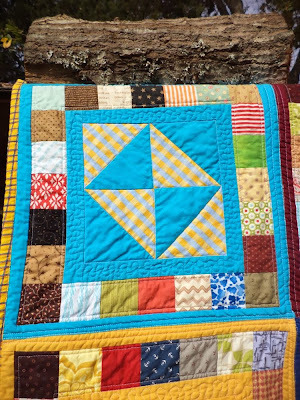 I decided to swap one of the blocks from the original quilt, and replaced it with one of my very favorites: the Ocean Waves block. 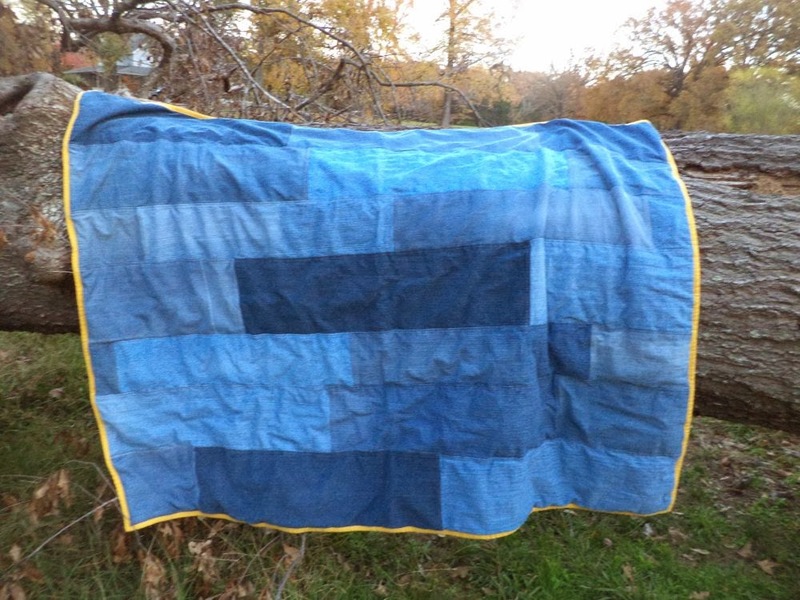 Some of you may remember that I made an entire scrap quilt from this block this time last year. It remains one of my favorites. I think that's a decent weekend's work! 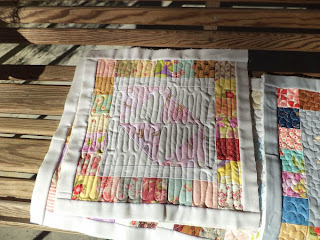 Linking up to Design Wall Monday at Patchwork Times. Welcome to week 3 and block 4 in the Quilt-as-You-Go Simple Sampler! The Dutchman's Puzzle block is made up of 8 flying geese units. We're using the technique detailed here to make 2" x 4" finished geese. First you'll need to cut (2) 5.25" blocks from your focus fabric plus (8) 2 7/8" blocks from your background fabric. 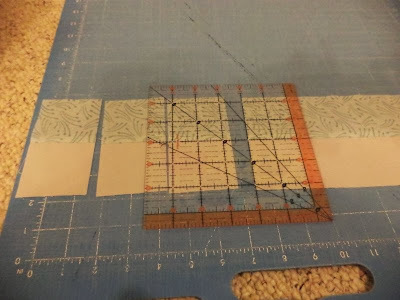 Using a ruler and a pencil mark a diagonal line across the back of each of the small background squares. 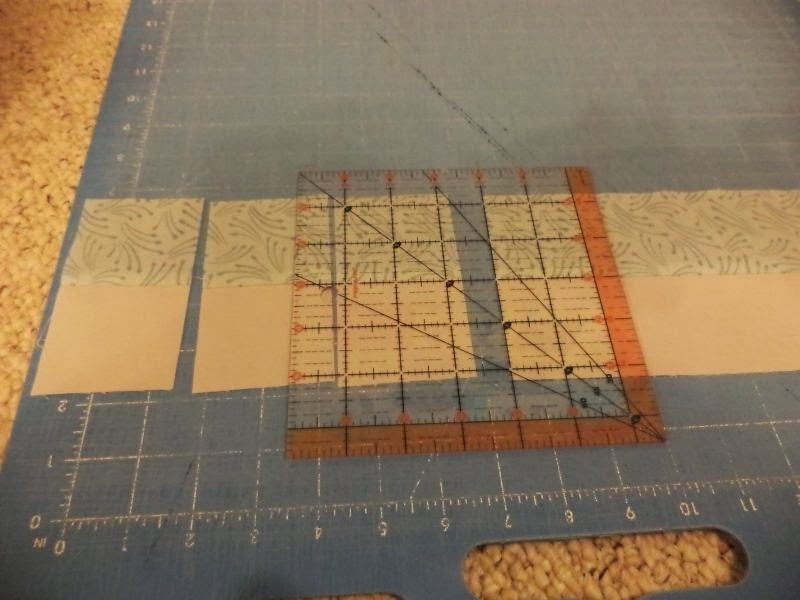 Place two background squares as shown onto each print square and sew 1/4" to each side of the marked line. 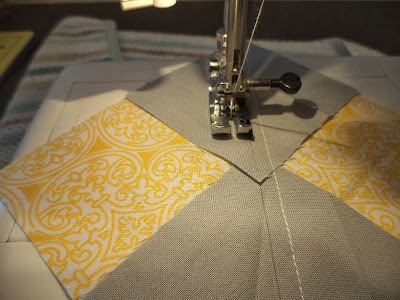 Cut the blocks along the line and press toward the darker fabric. 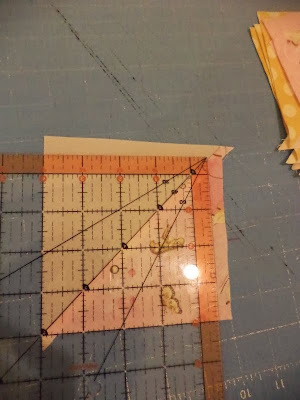 Then place a background square as show on each and again sew 1/4" to each side of the line. Be sure your first set of background squares are pressed up before you sew! Cut again along the marked line and press. 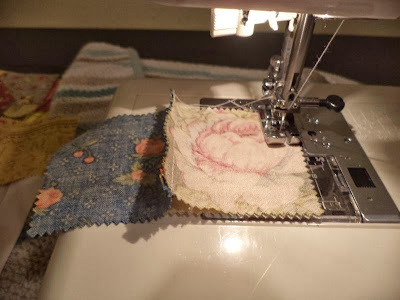 It's easiest to join the units together if you press the seams toward the background fabric. Join your geese units into pairs of two geese pointing the same way. 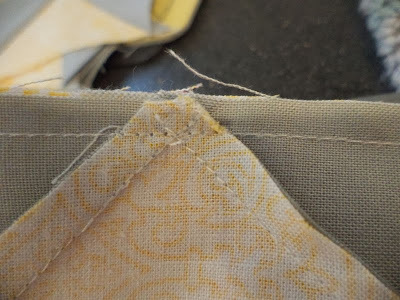 The best secret I have found to getting perfect points is to sew with the goose with the "point" on top as you are piecing. 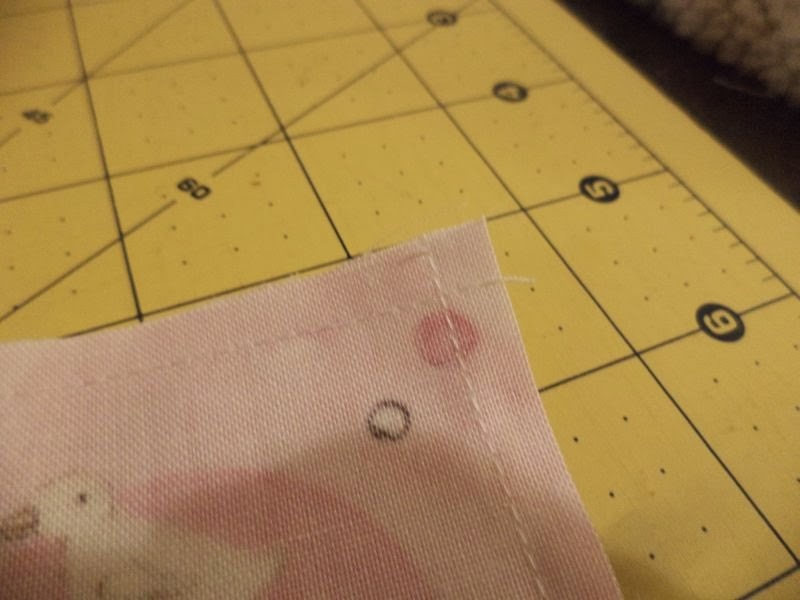 This way you can watch and make sure that your seam line goes across just at the point, and doesn't cut it off. Join the 2-goose units into pairs and then join those together, pressing at each step, to finish the block. Measure your finished block to be sure it is 8.5" square, and that's it! 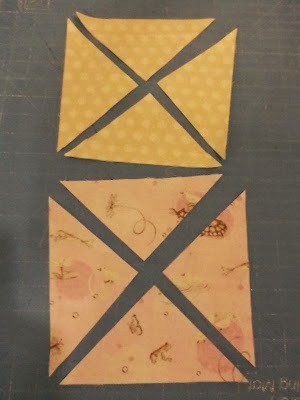 Be sure to check out the index post for instructions on how to add borders and make a quilt sandwich if you want to make quilt-as-you-go blocks. You know how sometimes you're cleaning out your closet, switching the summer clothes for the winter ones. And then you start sorting out the things that need to go to donations because you can't remember the last time you wore them. 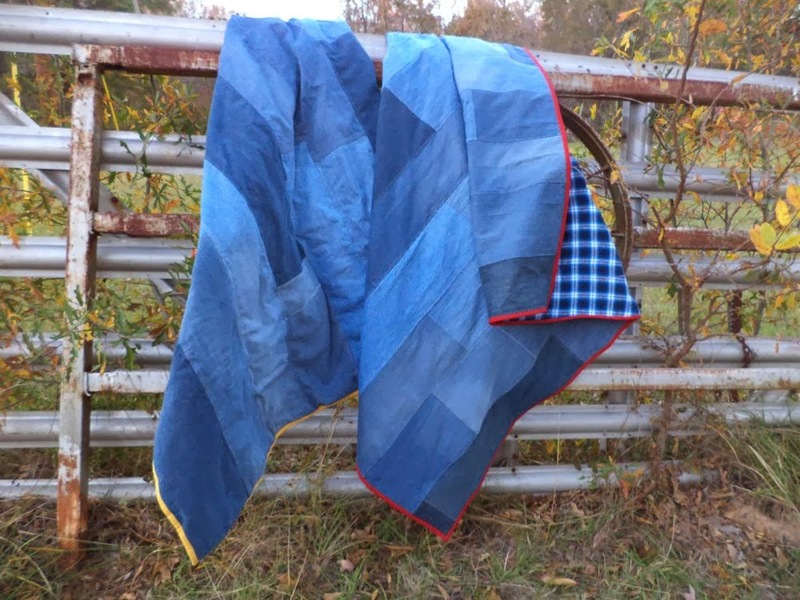 And then the next thing you know you're staring at a pile of worn out jeans and thinking about making a blue jean quilt? Well, that's where I was Sunday. I turned 8 pairs of old jeans into 32 fabric panels (2 from each leg) each about 30" long and between 6.5"-9" wide. 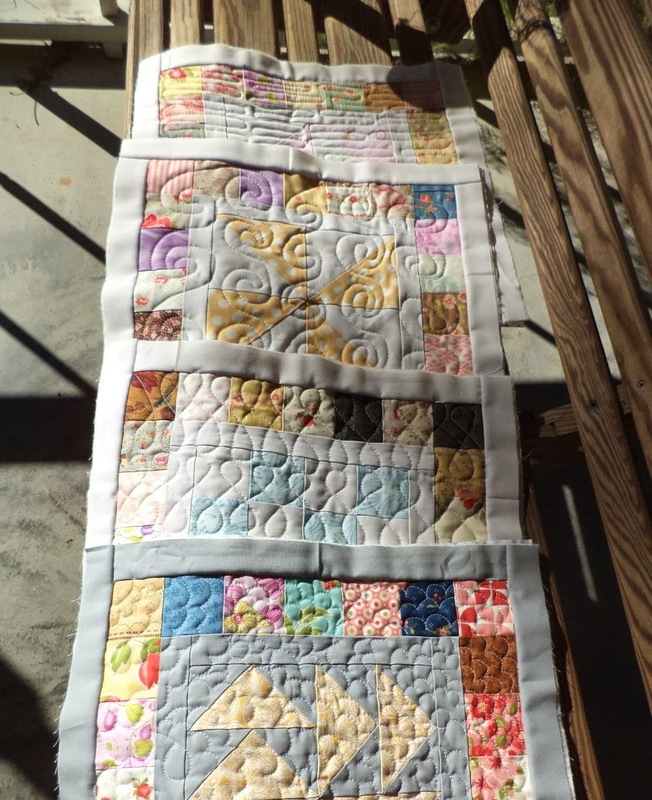 I was worried that 8 pairs wouldn't be enough for a good sized quilt (hah!) Turns out I had enough for not one, but two good sized throws. These are going to be Christmas presents for some family members. Making these was everything I expected it to be. 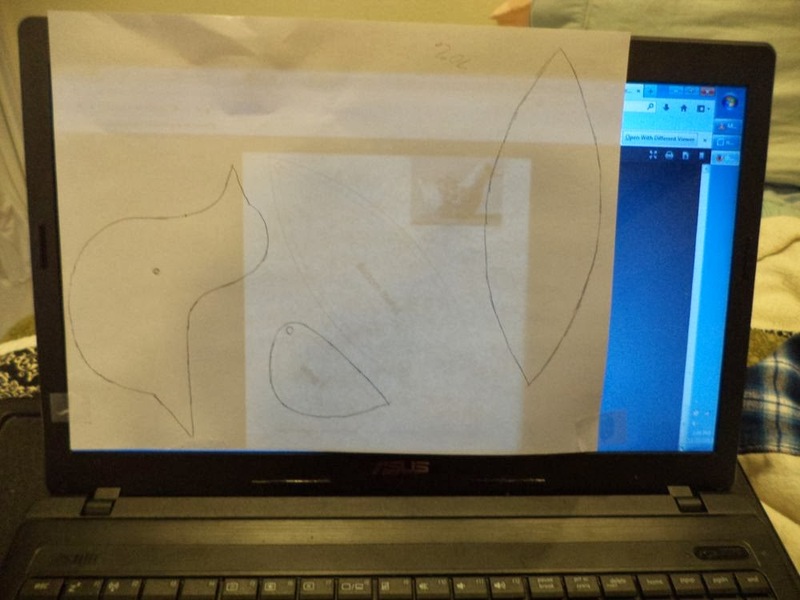 The simple design makes them really quick. The weight of all those pairs of jeans is kind of absurd, and really hard to shove through the machine. And it is pretty hard on your sewing needles! You'll need to start with a new needle, and maybe have a couple standing by. Normally I know that people usually skip the batting with jean quilts, since they are already so heavy, but I wanted these to also be really soft. The Hobbs batting I usually use is so low loft anyway, it adds a negligible amount of weight. I quilted these really simply, just top-stitching the seams down with a copper-y colored thread the matched the thread normally used in jeans. The quilts are backed with a super, super soft blue flannel home spun. It feels so nice! There was an issue with shrinkage, as you can see. 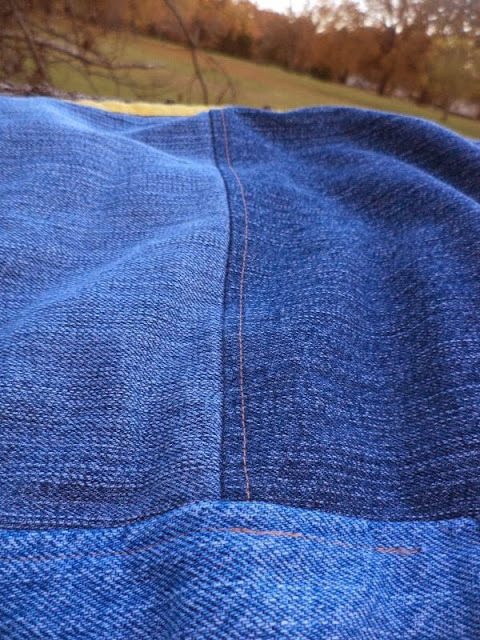 The backing and batting shrank a lot while the top didn't shrink at all (old jeans being thoroughly pre-washed.) I'm not bothered by the slightly baggy look left behind. These are so soft and cuddly. The jeans feel really nice-- and I suppose that makes sense, I mean, what is your most comfortable, cozy, worn-in, lived-in item of clothing? Mine would be my jeans. 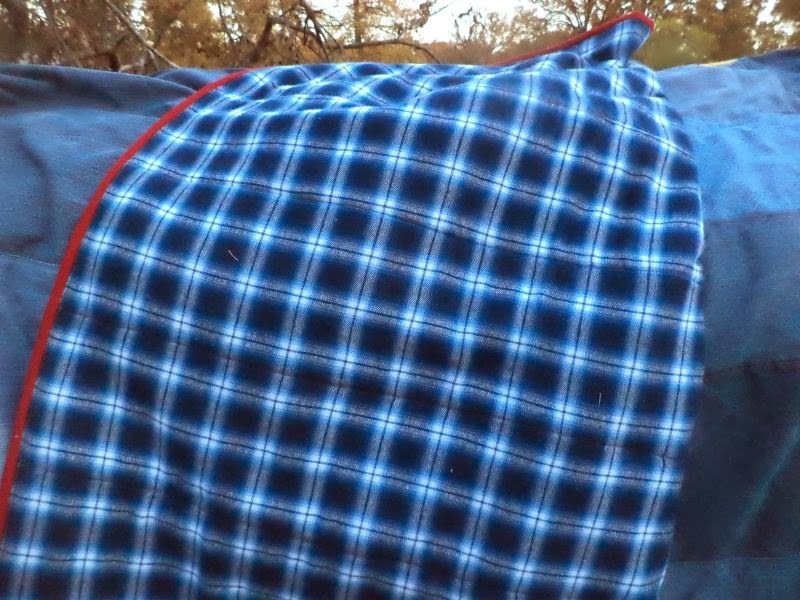 It's only natural that they would make a comfy quilt. 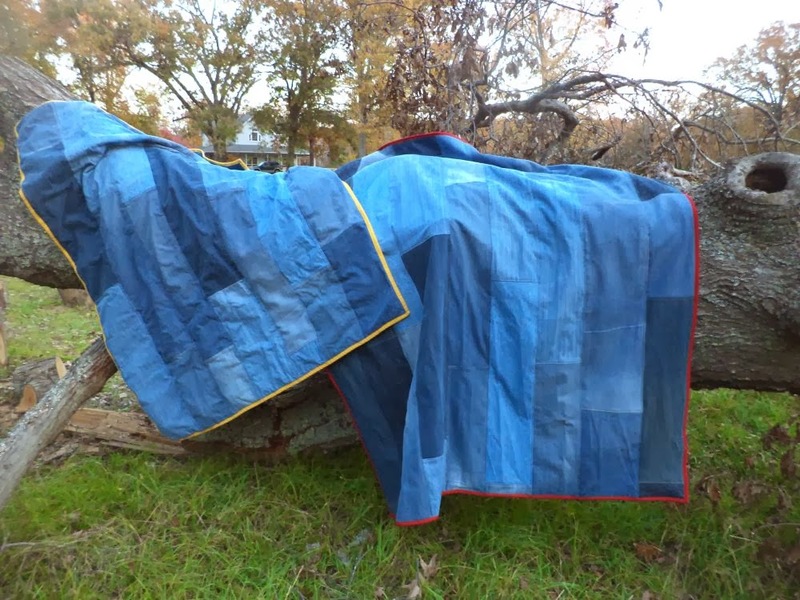 The quilts are both 70" long and about 55" wide (the red one is a little bigger). They're the same except for the binding. 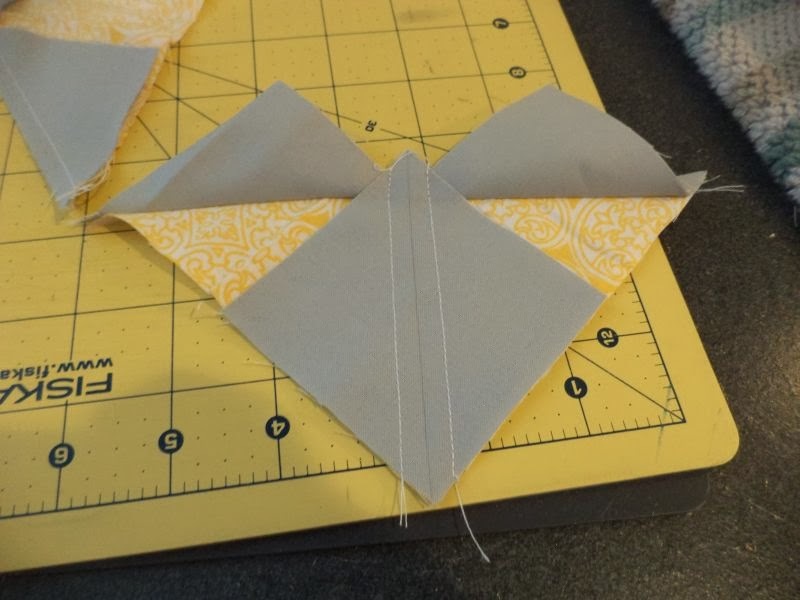 I thought the pops of colors on the binding would be fun, so one got a golden yellow solid and the other got red. These weigh a ton, so I hope I get to make the trip to deliver them in person! Can't wait for them to get some quality couch time. Today's WIP is somewhat of an un-WIP. 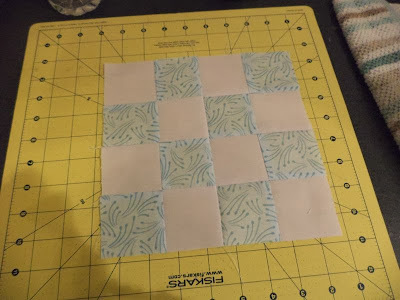 I'm picking out the FMQ pebbles I tried quilting on one of the QAYG Simple Sampler blocks. I guess I'm just really not much of a fan of this pattern. I was going to try it anyway, since part of the point of a sampler is to try different things and explore new techniques. But, after doing about a quarter of the block I still just didn't like it. So, I'm ripping it out and doing something different. One slow un-stitch at a time. 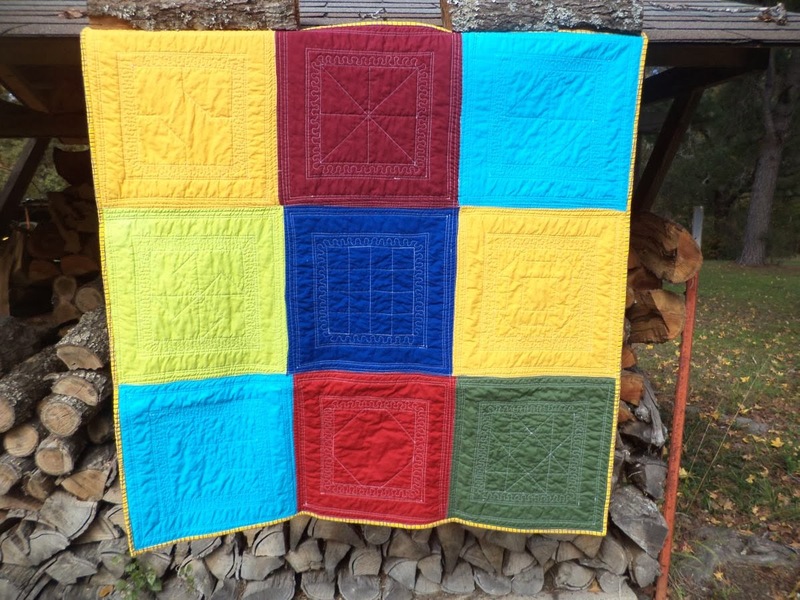 Welcome to week 2 and blocks 2 & 3 in the Quilt-as-You-Go Simple Sampler! 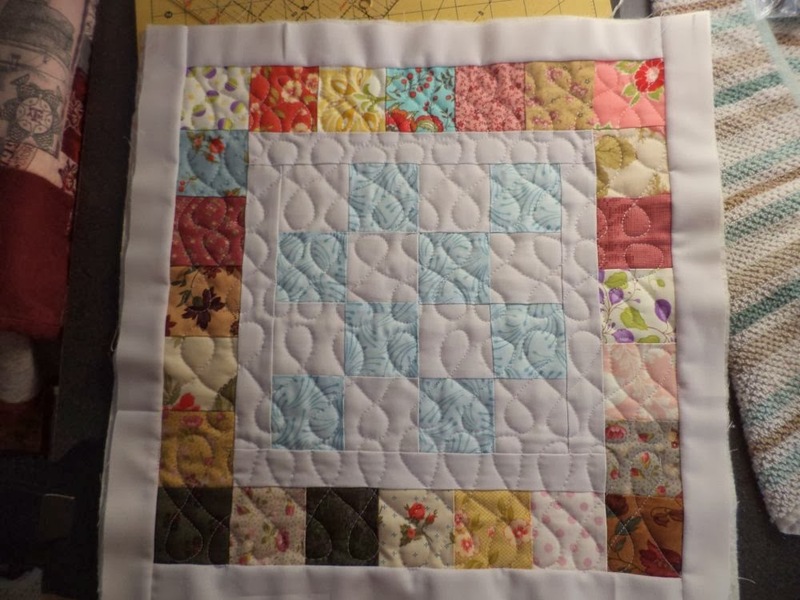 This week I am post the instructions for two blocks in the Simple Sampler that both use the same basic unit. The Broken Dishes and Pinwheel block are both made from four large half-square-triangles. For each block, cut 7.5" squares, one from the background fabric and one from your focus fabric. 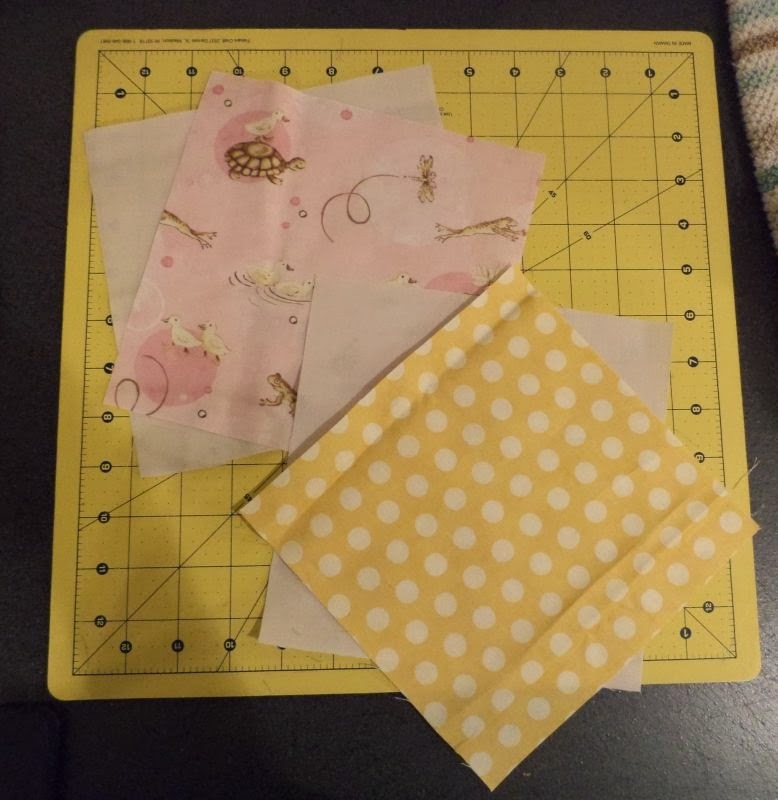 Place the print and background squares right sides together in pairs and sew all the way around all four side 1/4" from the edge. 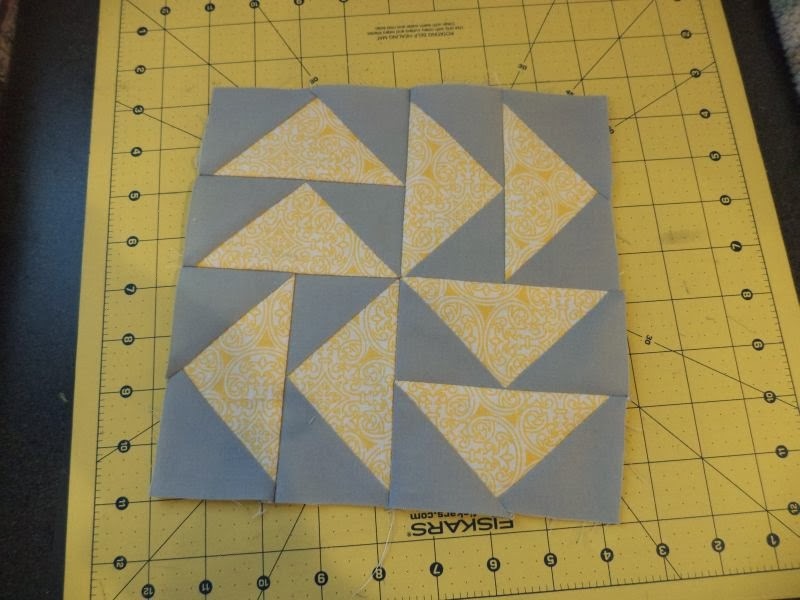 Cross cut the blocks on the diagonal twice to create 4 HSTs per block. Press the seams toward the darker fabric and trim the blocks to 4.5". Remember as you're trimming to line up the 45 degree angle on your ruler with the seam between the two fabrics in the blocks. 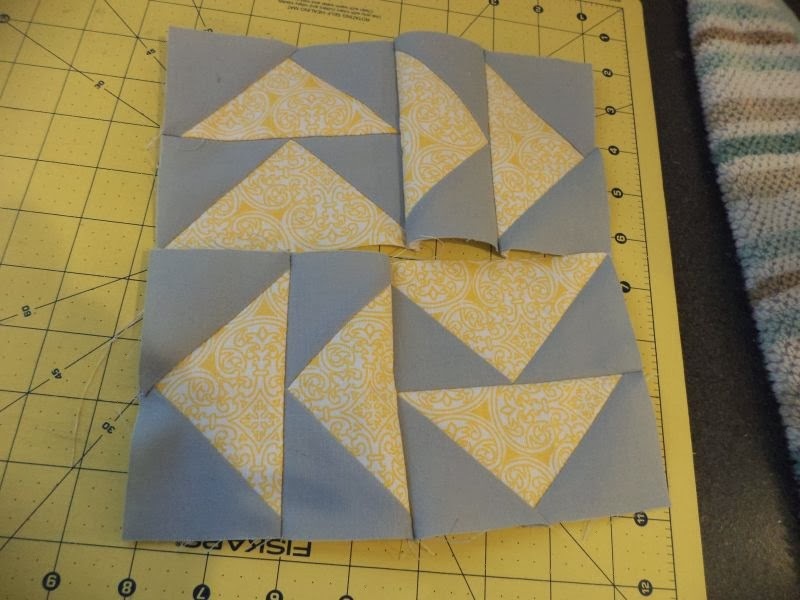 Now arrange your HSTs as shown to create the two blocks. 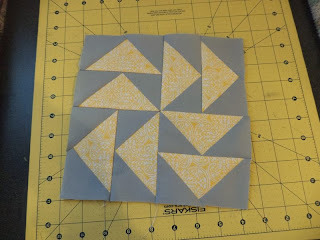 Sew the HSTs into pairs, then the pairs into a completed block and press. Measure the final block and trim to 8.5" as necessary. 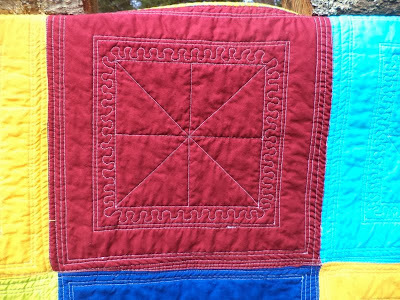 See the index post for instructions on how to add borders and create your quilt sandwich if you want to finish your blocks on that way. I am really enjoying trying different FMQ fills on these mini quilt sandwiches. Next week: Block 4, Dutchman's Puzzle. Happy Friday everyone! 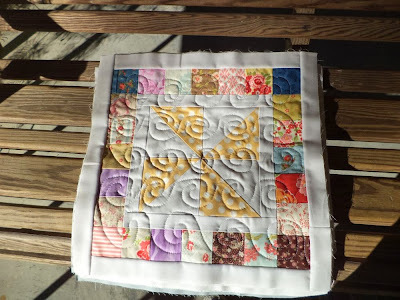 Today's finish is my first version of the Quilt-as-You-Go Simple Sampler. 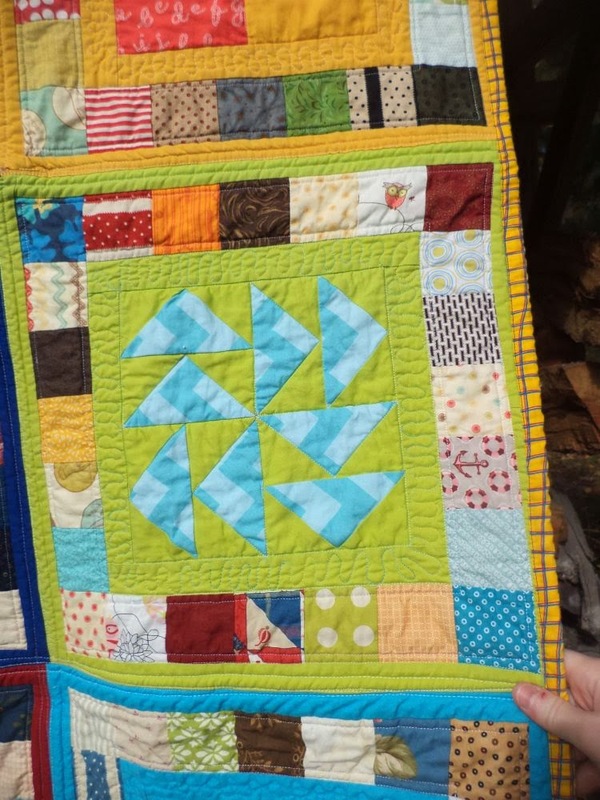 This one is done is boy-friendly bright colors. If you haven't already heard, I am making a girl version next and creating a series of tutorials as I go so you can make one yourself, if you wish! The index post, along with a link to the first block tutorial is here. Future block tutorials will go up every Monday. 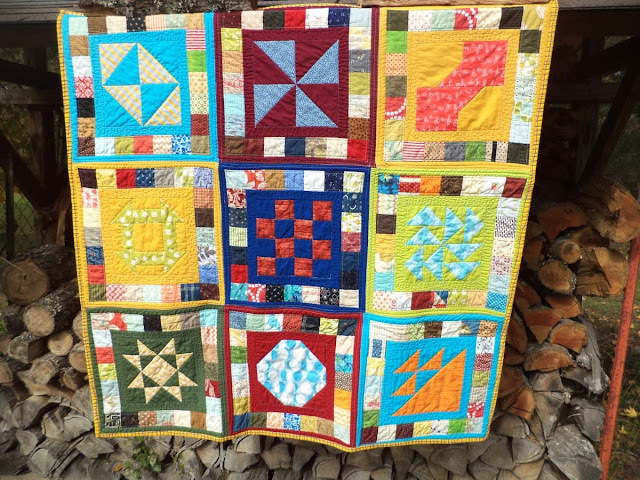 I created this quilt in order to use up my stash of 2.5" scraps while showcasing some traditional blocks. 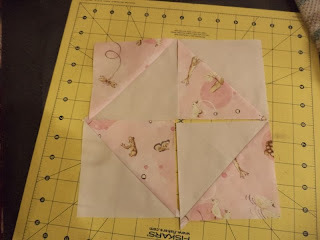 I decided to do it Quilt-as-You-Go style because I've been wanting to try that for a while and it gave me to opportunity to try some FMQ without the bulk of a whole quilt. 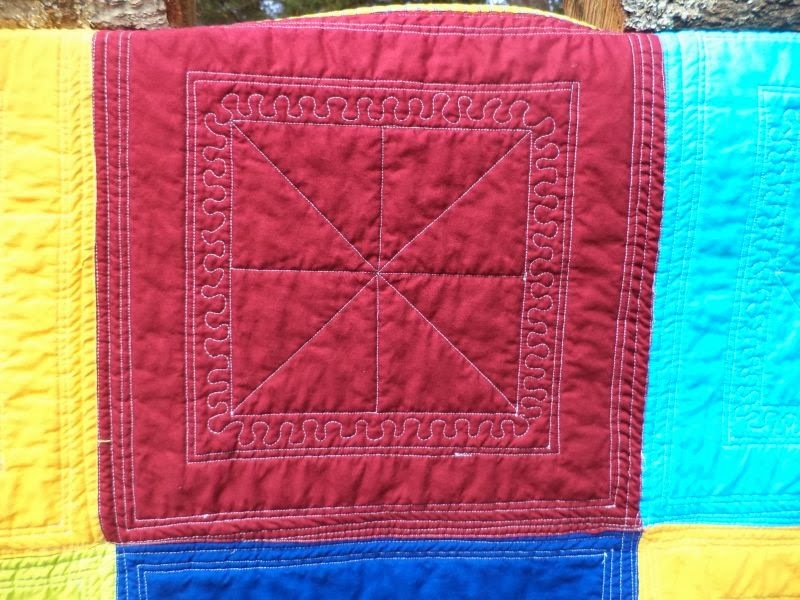 Unfortunately, there aren't too many FMQ designs that are not girly AND within my skill level, so I limited it to some squiggles in the sashing. No such problem for the girl version of this quilt, so I am having a blast with FMQ fills. 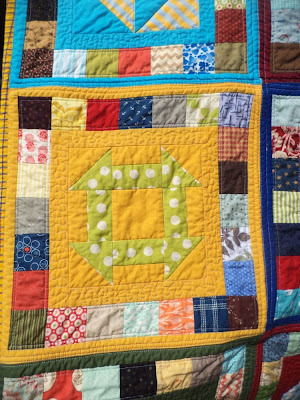 I used the same solid as in the front of each block for the back and the large patchwork effect on the back of the quilt came out great! 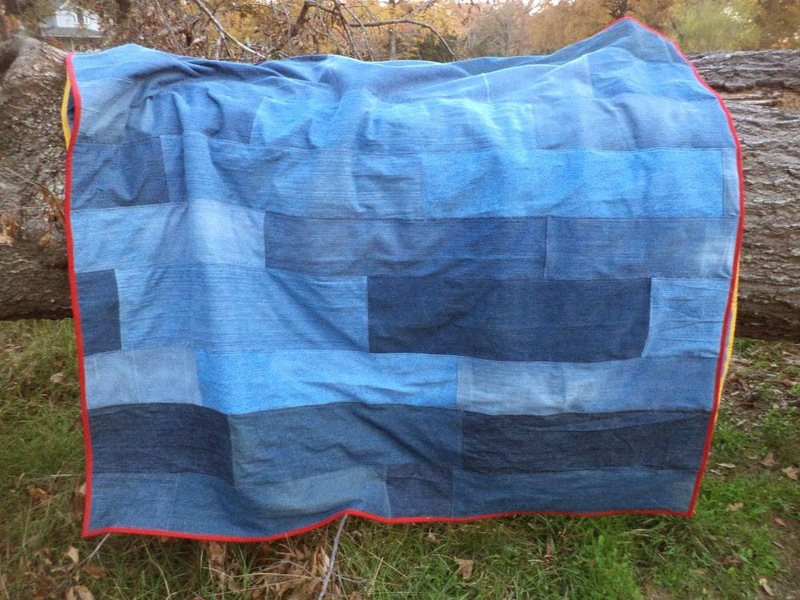 The quilting really looks cool from the back, too. 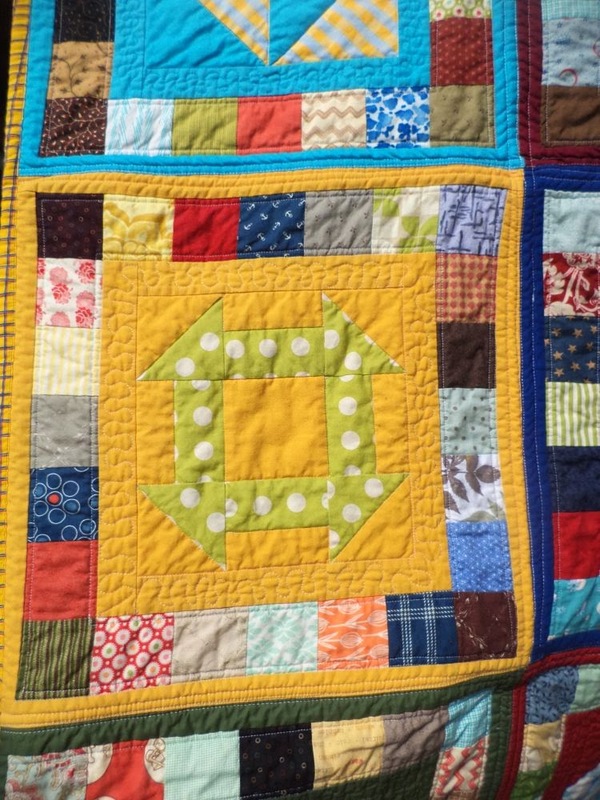 The blocks measure 16.5" so the quilt finished just under 50" square, perfect for a little boy! 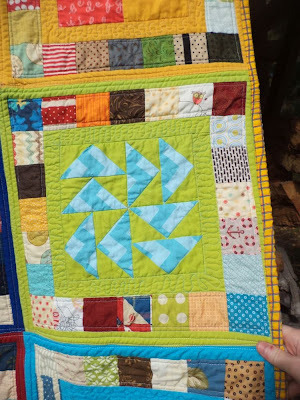 If you're interested in making your own quilt like this one, visit the Quilt-as-You-Go Simple Sampler index post here and watch this space every Monday for new tutorials! 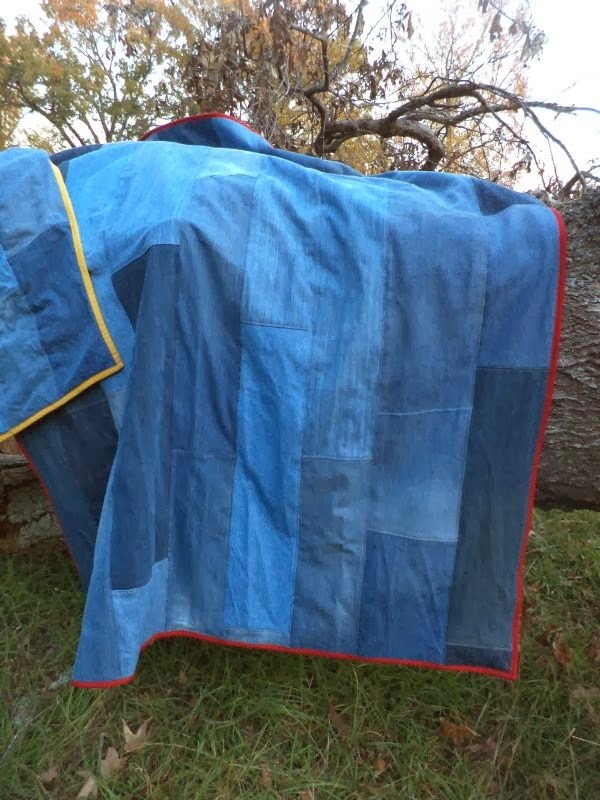 This isn't a sew along, just a collections of tutorials. But if you want to sew along, please feel free! 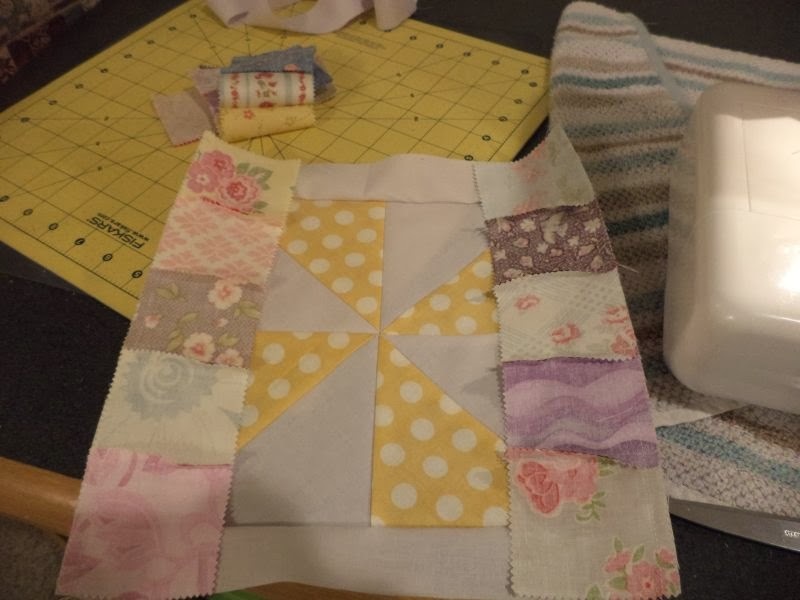 New blocks will be posted each Monday and I'm planning for 9 of them. Below you'll find the index list as well as instructions for bordering your blocks and making your QAYG sandwich. 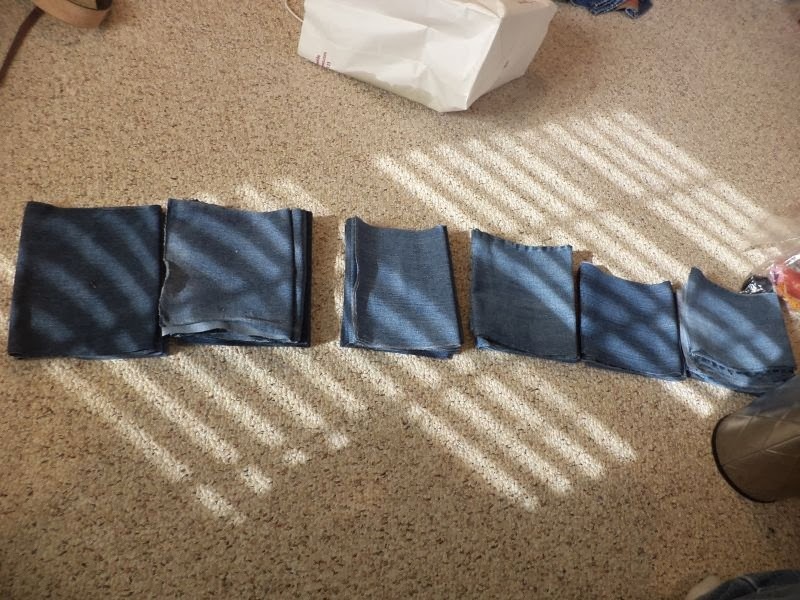 Subcut your background strips to (2) 8.5" long, (2) 10.5" long, (2) 14.5" long, and (2) 16.5" long. 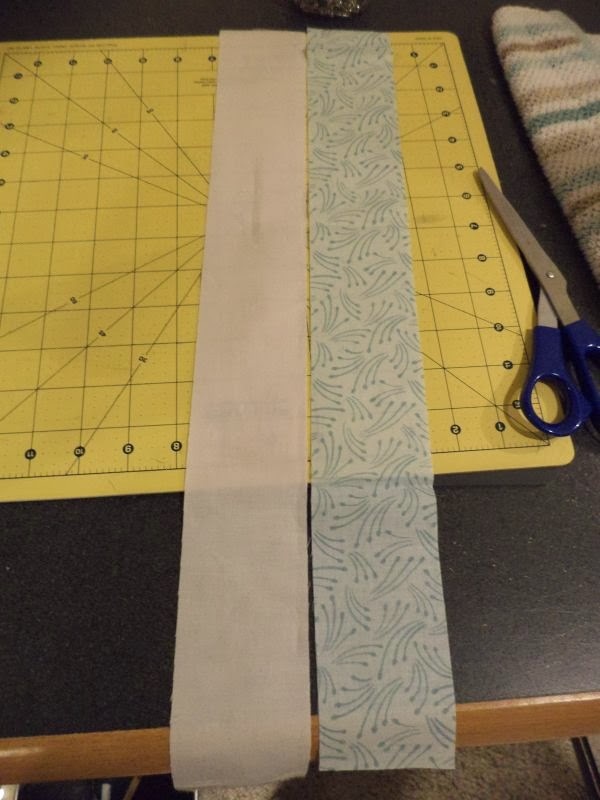 Sew the 8.5" strips to opposite sides of the center block, and the 10.5" strips to the other two sides. 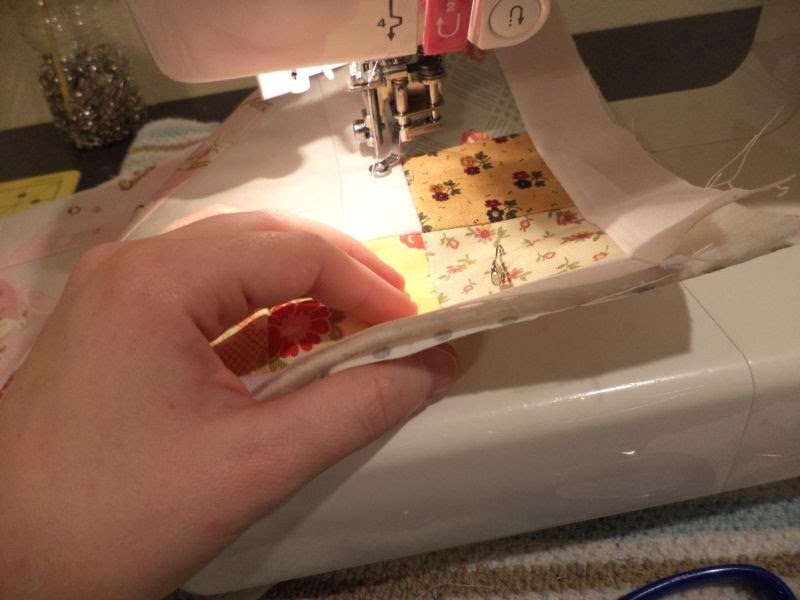 Press the seam allowance to the outside. Chain piece the 2.5" squares of scraps into (2) strings of 5 squares and (2) strings of 7 squares. I recommend you DON'T press these until after they are attached. 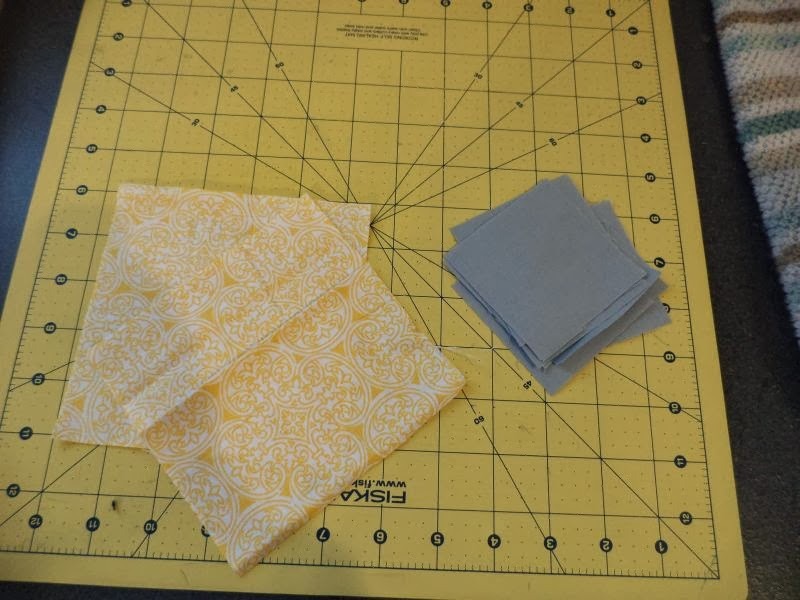 Sew the 5-block strips of scraps to the sides of the block where you attached the 10.5" border strips. 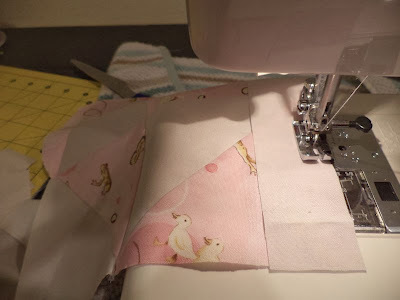 Sew the 7-block strips of scraps to the opposite sides, nest seams so that the seam allowance of the scrappy squares will be able to press toward the center. Press the block. 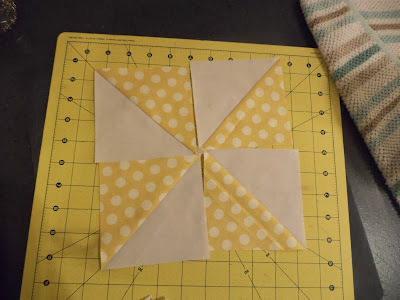 I recommend pressing the allowances of the 2.5" squares toward the center. Finally attach the 14.5" background strips followed by the 16.5" strips to the block and press the seam allowance toward the outside, finishing off the block. 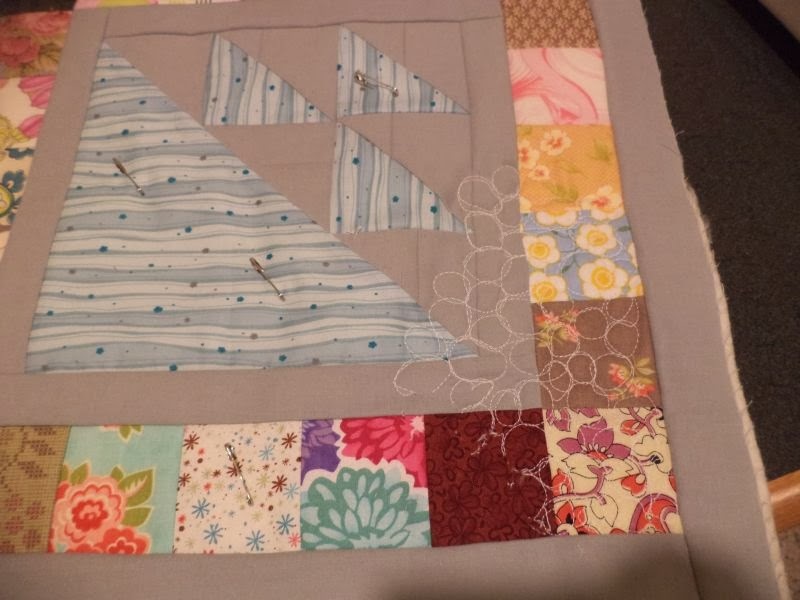 The final block should measure 16.5" finished. Quilt-as-You-Go is a great technique for those of us with small home machines. 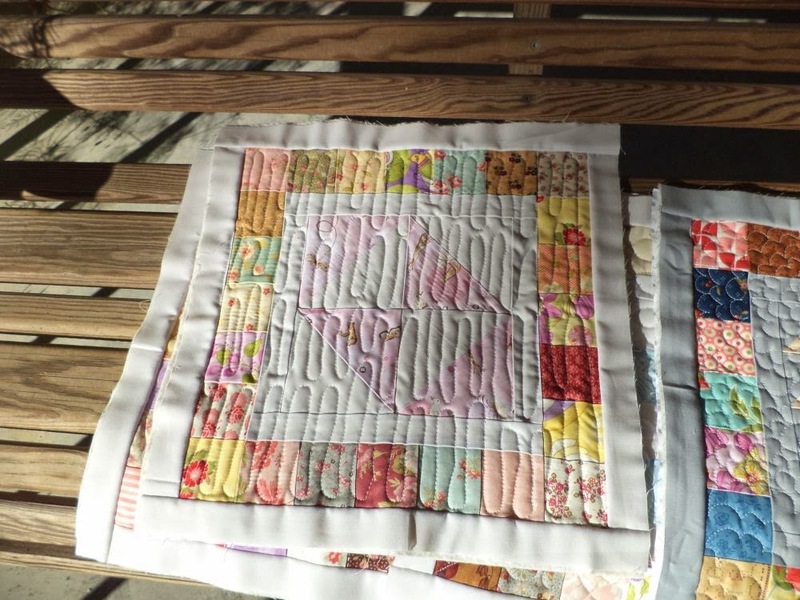 It allows you to practice your FMQ without fighting the bulk to a whole quilt. I am treating this quilt as not just a piecing sampler, but also a FMQ sampler, and practicing a different FMQ fill on each square. 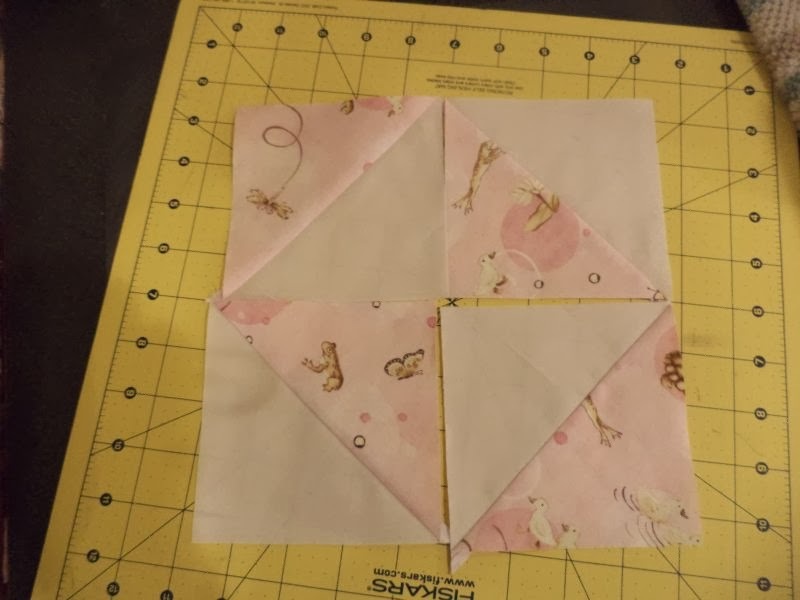 Making your FMQ sandwich is easy, just cut backing and batting pieces the same size as your block and layer like you normally would. 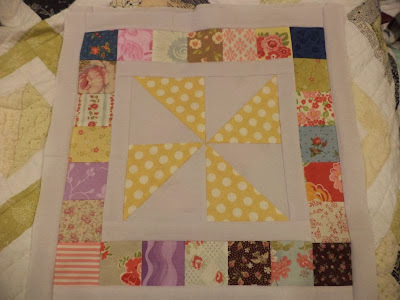 Pin sparsely and quilt! One thing I discovered with these little sandwiches is that straight line quilting really doesn't work very well (for me). There's just too much distortion, even with a walking foot. 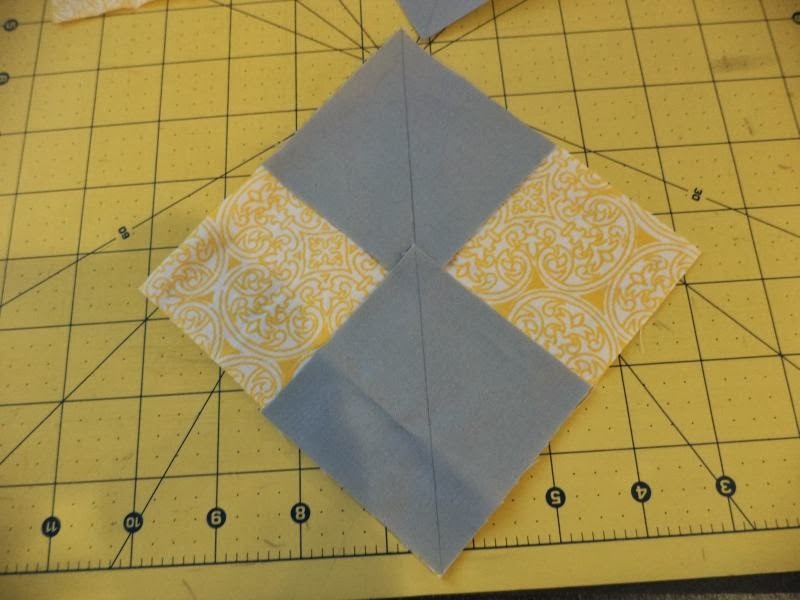 However, FMQ works perfectly! You need to stay away from at least the outside 1/4" of the block so that you'll be able to assemble your sandwiches into a whole quilt later. 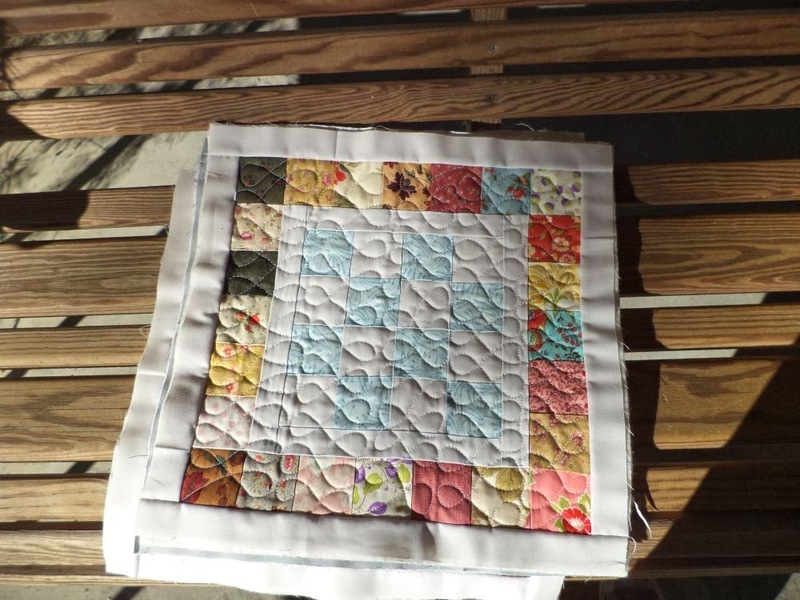 I decided to end my quilting at the scrappy square border just to be safe. Once we get closer to the end I'll make a post explaining how to join the quilted sandwiches together. It's Monday again. How do the days go by so fast? Last week I showed you the Quilt-As-You-Go blocks I was working on. 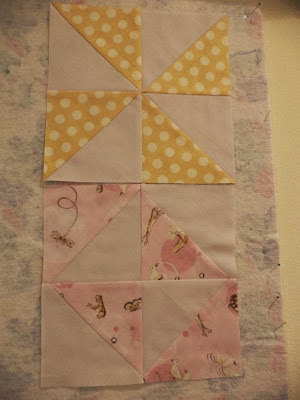 Those were for the boy color-scheme quilt, this week I am working on the girl version. I am having a lot more fun with the FMQ on this one. So many designs are just too girly to have used on the boy quilt. I've decided to write up tutorials for these blocks as I go and the Quilt As You Go techniques I am using. I'll post a new one each Monday, and the first one is going up today! 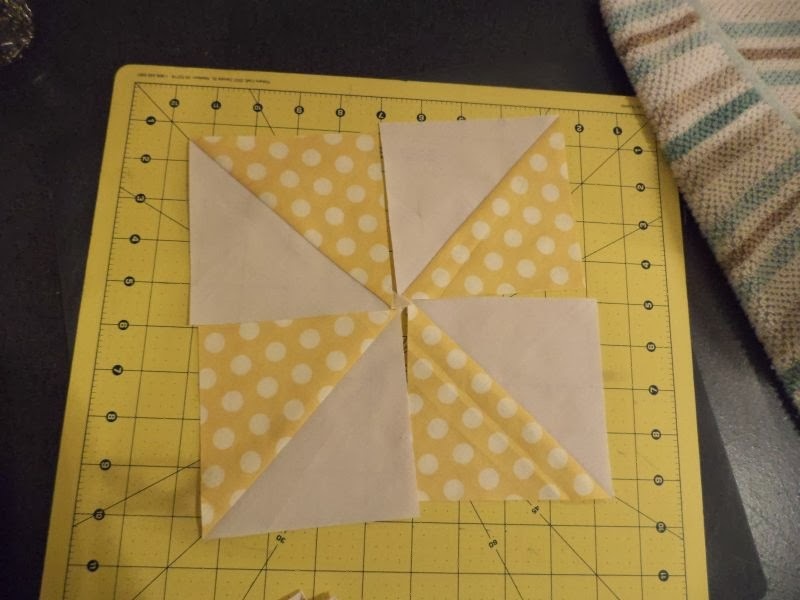 I'm going to be showing you how to make a different one of the 8.5" center blocks each week. 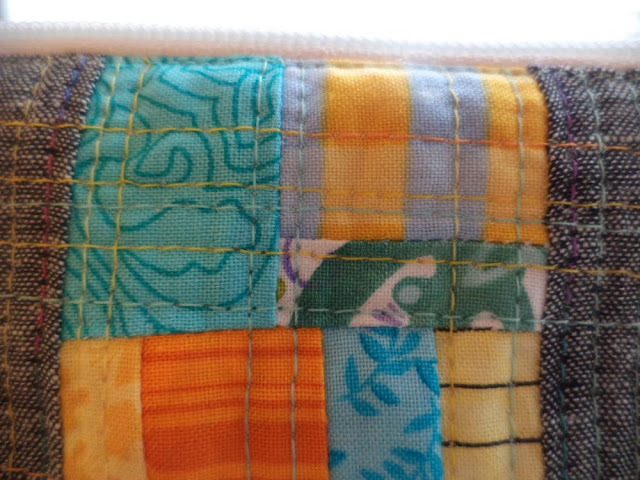 I'll make separate posts on the borders I add to my blocks and how I do quilt-as-you-go if you want to do the same. We're starting off with a simple 16 patch. Remember each of these tutorials will make a 8.5" unfinished block. To start with you need (2) 2.5"x20" strips, one from your focus fabric and one from your background. 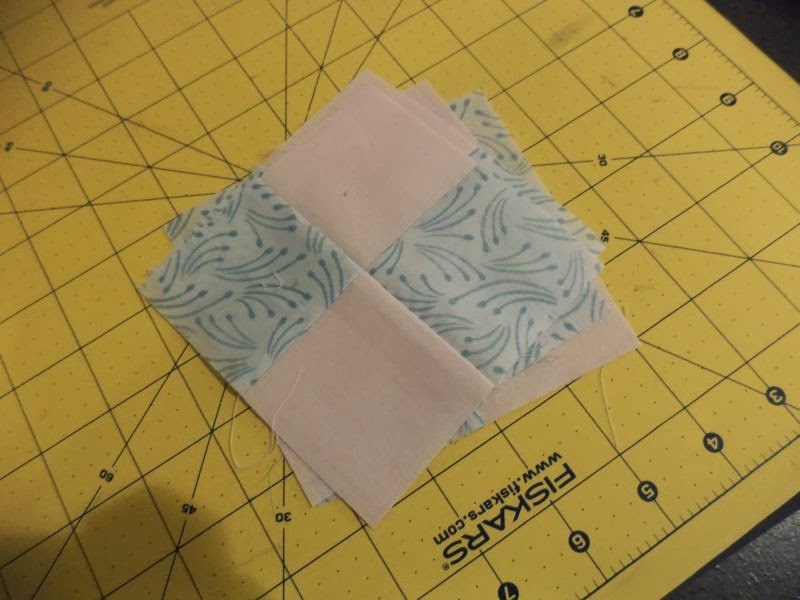 Sew the strips together along their long side, press the seam allowance toward the darker fabric, and cross cut into 2.5" wide units. You should have (8) 2.5" wide, 2-block units. Sew pairs of the 2-block units into four patches. 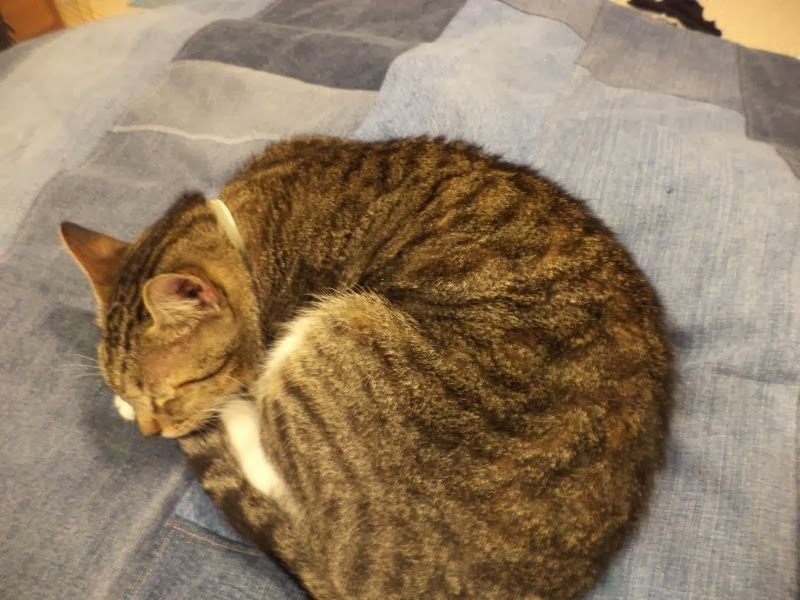 The seams should nest. 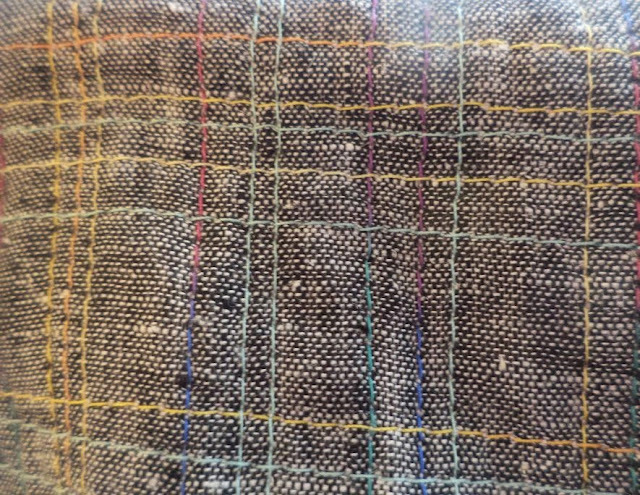 Then, press the new seams. Sew the four patches into a 16-patch block and press. 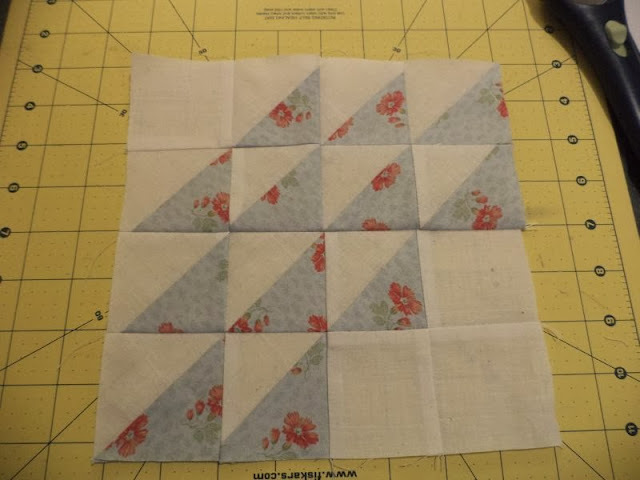 Measure and trim the finished block to 8.5" square. Easy peasy! 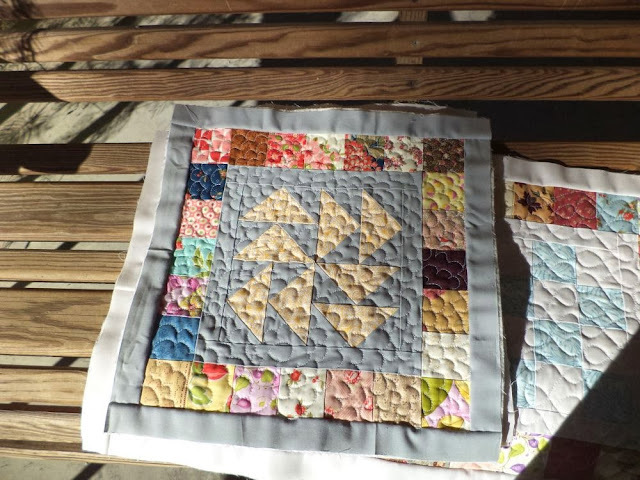 The master post and tutorials for adding the block borders and making a Quilt-As-You-Go sandwich is here.